I am proud to announce a new version of Metapad: 3.6. This release arrives almost 9 years since the last feature release! Metapad 3.6 has: a new high resolution app icon, UI & usability updates, a new feature that remembers folders across sessions, better defaults for general settings, UTF-8 file support and the biggest new feature: portability mode. Portability mode allows Metapad to properly run and save settings on an external or thumb drive and it will not leave any trace on a friend or family member’s system. This is also very useful when you are setting up an additional computer or migrating to a new one – copy over your Metapad directory and simply pick up where you left off. 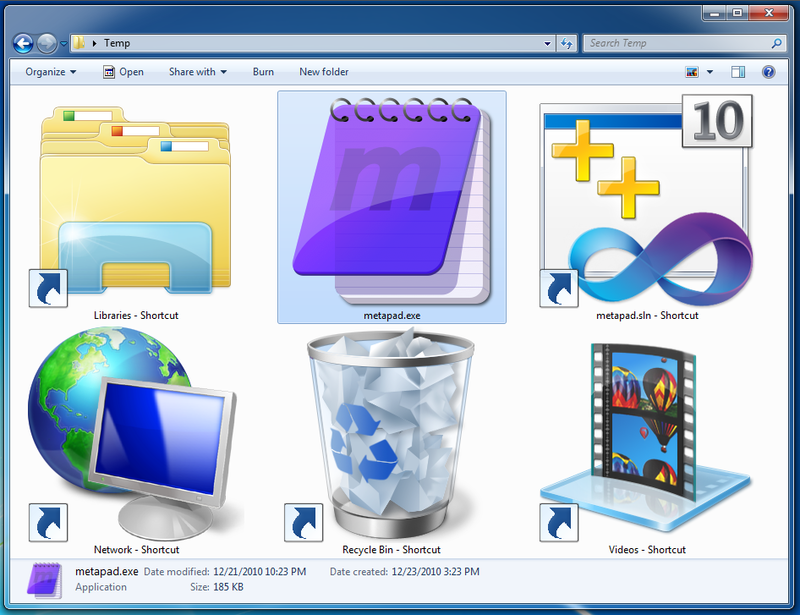 Technically portability mode means that all settings, window attributes, menu options, find/replace and recent file histories are stored and loaded in a local text file called metapad.ini (instead of the Windows Registry.) To enter this mode simply ensure that a file named metapad.ini exists where metapad.exe does – or use the one time command line option /m to migrate all your registry settings over. Cool. So why wait almost 9 years till a new feature update? About a year ago, after I released the Metapad source code, a fellow named David Millis sent me a code patch with a new feature he wrote for UTF-8 file support. This inspired me to get the code up and running again but I still wasn’t sure that I would get around to releasing a new version. Then when Windows 7 came out at the end of 2009 and I played around with it I was a little irritated by how shoddy the Metapad icon looked in the task bar (due to the lower resolution scaling up poorly). That feeling inspired me to refresh the icon which was lots of fun. Once that was done I knew a release was forthcoming so I slowly added the other features in my meagre spare time through 2010. Why is 3.6 twice the size of 3.5? Thats entirely due to the updated icon. Metapad’s new icon is almost 100 KB which makes the compressed download about 100 KB instead of about 50 KB. But hey, we’re still talking about kilobytes, here – not megas or gigas. How did you make the new icon? I used a neat little app called Opacity for the bulk of the design. I then used the slick tool IcoFX to clean up the pixels on the various size and color palette variations. Wait, isnt Opacity a Mac app? Yes and 3.6 was mostly developed on a Mac using Parallels to run a virtual Windows 7 machine. Weird. Will 3.5 language translations work in 3.6? What was the hardest part for development? First, getting Dev-C++ to generate a small binary or one that used the latest common control visual styles (I eventually gave up). Then getting Visual C++ to generate a binary that actually worked on Windows XP without an additional DLL. What changes are in the beta releases? Please email “metapad-feedback” at this domain, liquidninja.com. Thanks! Check out the Metapad homepage for more details and the Metapad twitter feed for news. Posted on December 23rd, 2010 and filed under technology. What a nice christmas surprise! Metapad is still on my system, although Notepad2 replaced it due to unicode and windows 7 integration support. But for text files with hyperlinks, I still use Metapad. Do you have ideas for further updates? Excellent News!… I’ve been on Metapad since ages and it’s really hard to give it up. I use it for HTML and PHP code and I even bought a CS4 Web Premium and guess what?… Metapad is still my primary tool for web coding… I just moved to Windows 7 so, let’s see how it goes. Thanks! It is the best news. It is still in use in all my computers. This amazing notepad’s replacement can’t be beaten by any other software. It has all needed features plus some more. Right click manu is so handy specialy with the “Make” command which can’t be found in any other program. Present notepad replacements are bloated with tons of functions needed mainly by coder and it is waste of time to try learn them. Please now continue your marvelous work. Holy moses. A new MetaPad? are you freaking kidding me??? OMG. thanks for the xmas present man!! WOOT!! Please email me with more details and I’ll see what I can do. Thanks for the kind words Cecil, Alexander, Edgar & HomiSite. Thanks for your dev efforts. Any change of Metapad ever having a tabbed interface? I personally would appreciate this very much. I love Metapad, but there is a problem with foreign fonts which do not reproduce properly. I wish that would be fixed as the highest priority. Also the ability to store and read more different formats including rtf, doc, pdf …. A huge THANK YOU ! ! ! I have used metapad for years – probably since soon after it was released – and use nothing else for a notepad replacement. The only thing I have wished all this time was that I could run it from a USB stick and keep all my settings. This is a fantastic improvement and I am go pleased to see you give metapad an update. Thanks again ! ! When I first came across metapad last year, I saw the site was still active but the program hadn’t been updated for years. I concluded that the program is obviously close to perfection and doesn’t require updating. I think it’s awesome that a near-perfect program has gotten even better, especially with portable mode. Thanks a lot! I keep checking the Metapad Home Site but just found about this new update when visiting How-To Geek (www.howtogeek.com). Great news and great Christmas present! I´ve been using Metapad for ages and it´s a solid rock piece of software. Thank you! Really liked this new portable mode. I would like to see a tiered approach. 1. A simple notepad replacement. 3. An ultimate add-on that will allow programmers to use it with plugins for C, VBS etc. Just switched to metapad from editpad. I like it, but is there a tab function so that I can have many text files in editpad … but in tabs?? You’re program has been at my side for the past 6 years I think. This seems like a great notepad replacement. The only thing I want to know is how to change the hyperlink color? I want a blue background for metapad and that conflicts with the blue hyperlink color. Also, why doesn’t the terminal font show ascii art properly like it does with notepad? Is anyone able to get that to work? Look up ascii art in wikipedia for more info. MetaPad is amazing, Been using it 8 years. Nothing beats it for what it is and what its used for. Favorite features being the trasparent mode and always on top. Love the new icon, but i see no new updated “hidden” l33t icon ;) for shame! lol, but fun though. Thanks again for making the best notepad replacement program out there. You did an A-M-A-Z-I-N-G job, THANKS!!! I just love all the new things you introduced in v.3.6 but most of all the local .ini and its ability to migrate settings from the registry!!! Metapad beats the *beep* out of the other so-called-Notepads!!! I have been using metapad at least 10 years, since well before 3.5, as my standard Notepad replacement. This new version was a nice surprise … and I do mean surprise! Saving the configurations in an .ini file rather than the Registry is a worthwhile new feature. Those requesting tabs and other fancy add-ons: My take is that Alex’s intent has always been to minimize metapad’s size, subject to a functionality constraint. The willingness to incur the size burden of the new icon relents a bit on this, but processing power and RAM are orders of magnitude cheaper than when metapad was created. 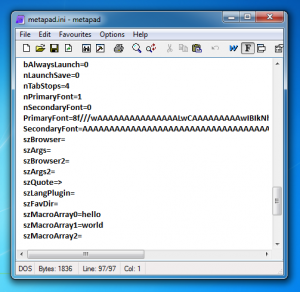 There are plenty of text editors out there which load multiple documents, code coloring, etc. (More power to the guy who codes PHP and HTML using metapad!) metapad’s feature set is hands-down superior to Notepad’s, while the program is still basically tiny (albeit larger than Notepad). I am very happy to keep things this way. Set the Color to the desired Default Color. Metapad now shows hyperlinks in the selected color. Nice! I just dropped into the site again to grab the link and found out a new version was out last December :) I’ve been using 3.51 for years, and installing it on other PCs too, so this is very good news. Thank you so much. Hey i am using Metapad_3.51 since 2006 on my portable USB and it does a f*****g good job. With it’s hyperlink features you can make your portable Bookmark compilation and with the combination CTRL+F3 it is possible to jump from a Index Header to the specific location and you don’t have to previously mark the line because of the auto-marking function. This feels like a intern hyperlink and i love this function. This keeps your file very small and nevertheless very functional. Metapad is small, portable, hyperfast, supereffective and must be in all likelihood a labor of an Ninja! finally an update :) could you please fix the case conversion bug. right now title case converts “metapad’s” into “Metapad’S” erroneously capitalizing the “s”. yay, finally some updates to my fave notepad replacement :) could you then please fix the case conversion bug. right now title case converts “metapad’s” into “Metapad’S” erroneously capitalizing the “s”. Thanks, that’s a good one to fix. 2) please disable checking language dll (not only /v switch) but eg in .ini file. one more thing that i’m having a problem with, which may even be intended behaviour or limitation, but if so, i don’t see a real purpose to it. find/replace text fields are limited to 100/101 chars (depending on the method used to enter the text), which sometimes is a real problem (long urls for example). especially so since metapad doesn’t alert you about dropping chars when you don’t actually type the text in either field, but as is more natural, you paste it, or just enter it by selecting it in metapad (this method cuts 1 more char than pasting). i’ve been burnt a few times, before i noticed this limit, since everything seems to work as expected, until you actually check what’s been done and notice the errors left by the replace operation. kudos again for a real nice app. btw there doesn’t seem to be a download link for beta 5, just beta 4. Thanks, I agree that sounds unpleasant. I’ll revisit those limits and may address the issue in a future release. I suspect there is a minor bug in the METAPAD editor. Editor changes text appearance when some character occurs. Text appearance changes only one time in the editor window. It does not return back. I live in Czech Republic. I mostly use windows codepage 1250. Text appearance in Metapad window changes when character “ě” or “ů” occurs (maybe some other character but I am not sure). I have seen the appearance change in Metapad ver. 3.5 and 3.5.1. I have not seen it in LE version. The same I saw just after ver. 3.6 beta installation. To verify bug I can enclose two text samples. After I met the bug I tried set else primary and secondary font. The bug disappeared after it. The bug did not come up when I set default fonts. I have installed Metapad on other PC. The bug comes up at default setting. I can send listings part of registers to compare changes. Though the shortcoming I use Metapad for some years. It is an excellent replacement of Windows Notepad. Metapad properties are the proper I need. I recommend other people to use Metapad. The File Format sub-menu confuses line ending sequences (CR,LF “DOS text” vs. LF “UNIX text”) with file encodings (local/Windows CP vs. UTF-16LE vs. UTF-16BE vs. UTF-8). Please make the combinations of “UNIX text” (LF line ending sequence) with any of the supported Unicode encodings available too. Another suggestion related to the Unicode encodings: A separate option to choose whether BOMs are used. In particular, the UTF-8 “BOM” is a UTF-16 concept misused to mark UTF-8 files. The ability to open and write UTF-8 encoded files without this mark would be useful. It might also be useful to someone to have the option of CR line ending sequences (“Mac text”?) available. The current “UTF-8 support” does not support UTF-8 at all(! ), it only saves files encoded with the current Windows ANSI CP with the three-byte “UTF-8 BOM” prepended. Please disable this incomplete support or have someone complete it first. Would it be possible to have an auto backup feature..a simple copy with a .bak extension would suffice. Thanks so much for the new version. I have tried numerous notepad replacements, and this is by far the best I have come across! Yes the UTF-8 feature is more of an “experimental” one and probably should be described better. Unfortunately I don’t “have” anyone to complete it but since this is an open source project I will happily accept source code contributions. I’m using metapad for almost …, well, I don’t remember :) It’s a great tool, thanks. Metapad LE is very slow when opening ~400K text files on win7 x64. No problem with non-LE metapad. I’m Unix admin and love metapad. It’s small and fast and lets me convert my file formats. Good on you for getting 3.6 out! happy to see you working on this again. I’ve been using metapad almost since the initial release and haven’t found anything else I like quite as much. Oh, this is COOL! I’ve been using Metapad since before 3.5 (can’t remember version), and I’ve been a staunch supporter of it all along to my friends. Came to the site to DL it for mygirlfriend’s PC and happily found the update. Thanks for the GREAT program. Many thanks for your free tiny jewel, metapad. I’ve been using metapad as my notepad replacement (i.e. all time text editor) since long time (before y2K). I really like its ‘Favourites’ feature, quite useful for instant retrieval of frequently used text files. Of course there are some other new cool ones…but it’s great that metapad remains lean, not having too many features otherwise it’ll be bloated (something resembles the heavy bulky gun, UE :)) Metapad is still less than 200k! Again, thanks a lot for your little wonder!!! Greetings and respects from Asia! I fell in love with metapad at first use! :) Been recommending metapad to all my friends ever since. I just started working at a new company and was given a win7 laptop. I was wondering if the instructions to change win7 blue notepad icon to metapad’s icon using the registry tweak is correct.. I noticed there’s a “” on the hex values. Is that intentional ? I haven’t tried importing the registry values yet. Have anyone with win7 tried it? Does it work without errors? Thanks so much for continuing development!! I’ve used metapad for more than a decade, and it’s always one of the first apps I install on a new machine. Thanks also for making it easy to donate! !